We have generated a panel of mAbs that identify three presumably novel human dendritic cell Ags: BDCA-2, BDCA-3, and BDCA-4. 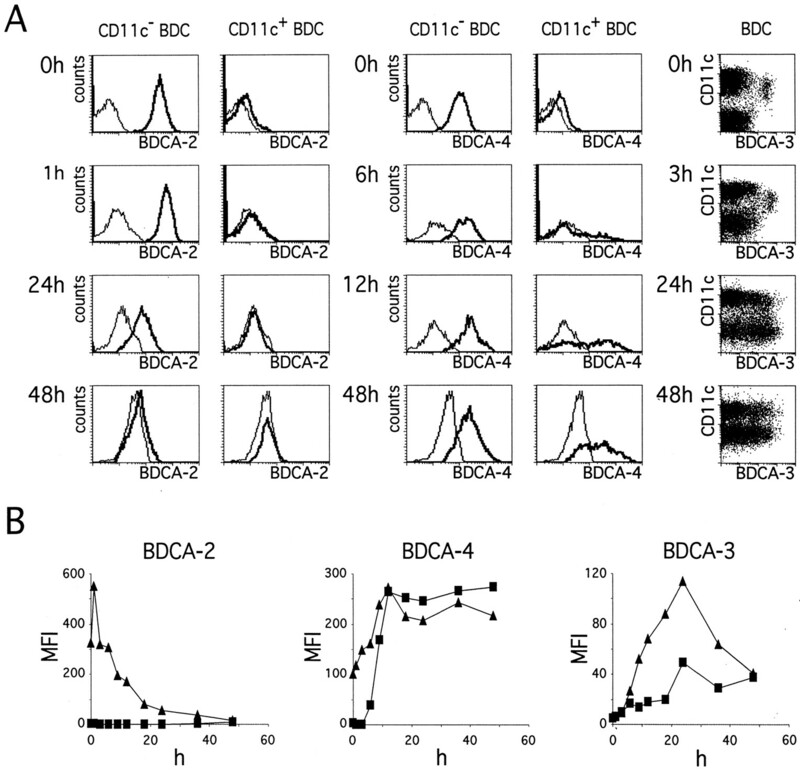 In blood, BDCA-2 and BDCA-4 are expressed on CD11c− CD123bright plasmacytoid dendritic cells, whereas BDCA-3 is expressed on small population of CD11c+ CD123− dendritic cells. All three Ags are not detectable on a third blood dendritic cell population, which is CD1c+ CD11cbright CD123dim, or on any other cells in blood. 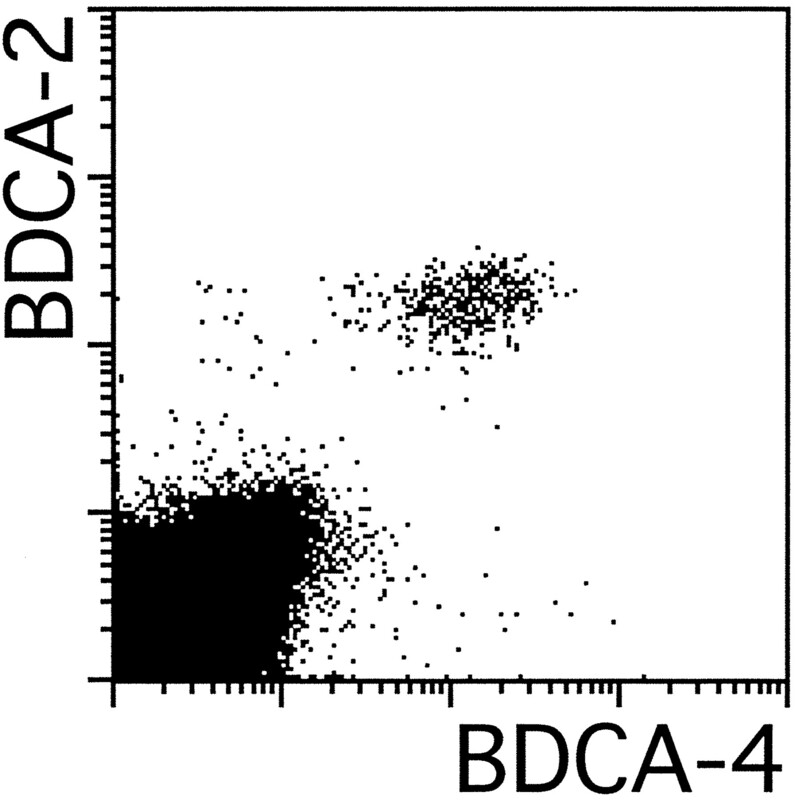 BDCA-4 is also expressed on monocyte-derived and CD34+ cell-derived dendritic cells. Expression of all three Ags dramatically changes once blood dendritic cells undergo in vitro maturation. BDCA-2 is completely down-regulated on plasmacytoid CD11c− CD123bright dendritic cells, expression of BDCA-3 is up-regulated on both plasmacytoid CD11c− CD123bright dendritic cells and CD1c+ CD11cbright CD123dim dendritic cells, and expression of BDCA-4 is up-regulated on CD1c+ CD11cbright CD123dim dendritic cells. BDCA-2 is rapidly internalized at 37°C after mAb labeling. The three presumably novel Ags serve as specific markers for the respective subpopulations of blood dendritic cells in fresh blood and will be of great value for their further analysis and to evaluate their therapeutic potential. Studies of blood dendritic cells (BDC)2 have been hampered by their scarcity and the lack of BDC-specific cell surface markers. Methods for the detection and isolation of fresh noncultured BDC are commonly based on a multitude of immunophenotypic criteria, such as the absence of a panel of leukocyte lineage (lin)-specific Ags (e.g., CD3, CD14, CD19, and CD56) and the presence of HLA-DR, CD4 or CD33 (1, 2, 3, 4, 5, 6, 7, 8, 9, 10, 11, 12, 13). From analyses of freshly isolated lin− BDC it became evident that BDC do not represent a homogeneous cell population, but, rather, a mixture of at least two populations (3, 4, 5, 6, 7, 8, 10, 14): 1) CD123bright CD11c− BDC, which possess a plasmacytoid morphology, express CD45RA, and depend on IL-3 for their survival and differentiation into mature DC with typical dendritic morphology and potent T cell stimulatory function; and 2) CD123dim CD11cbright BDC, which are rather monocytoid in appearance, express CD45RO, and spontaneously develop into typical mature DC even when cultured without any exogenous cytokines. Plasmacytoid CD123bright CD11c− BDC display some features, such as the expression of the pre-TCR α-chain, that indicate that they may arise from lymphoid precursors (4, 14, 15), whereas CD123dim CD11cbright BDC display all the criteria of myeloid DC (3, 4, 5, 6, 7). DC resembling plasmacytoid CD123bright CD11c− BDC have been detected in the T cell-rich areas of lymphoid tissue (16) and were initially erroneously designated plasmacytoid T cells or plasmacytoid monocytes due to their morphology and phenotype (17, 18). DC resembling CD123dim CD11cbright BDC have been found in the dark and light zones of germinal centers (19). Here we describe a panel of new mAb raised against immunomagnetically purified CD4+ lin− BDC that identify three presumably novel BDC Ags: BDCA-2, BDCA-3, and BDCA-4. In fresh human blood, expression of BDCA-2 and BDCA-4 is strictly confined to plasmacytoid CD123bright CD11c− BDC, whereas expression of BDCA-3 is restricted to a small population of CD123− CD11c+ BDC. This small population of BDCA-3+ BDC shares many immunophenotypic features with classical CD123dim CD11cbright BDC, but unlike CD123dim CD11cbright BDC, BDCA-3+ BDC lack expression of CD1c (BDCA-1), CD2, and several of the Fc receptors. Five 6- to 8-wk-old female BALB/c mice (Simonsen, Gilroy, CA) were inoculated with ∼5 × 105 to 1 × 106 purified HLA-DR+ lin− BDC under anesthesia on days 0, 4, 7, 11, and 14 in the right hind footpad and with ∼1 × 106 HLA-A2+ Bristol-8 B lymphoblastoma cells in the left hind footpad on days −3, 0, 4, 7, 11, and 14 (30). Both cell types were incubated with 1/100 PHA (Life Technologies, Gaithersburg, MD) for 10 min at room temperature and washed with PBS before injection. On day 15 the cells of the mouse right hind popliteal lymph nodes were fused to SP2/0 Ag14 myeloma cells. Fused cells were plated on 96-well plates in DMEM supplemented with 20% FCS (HyClone, Logan, UT), 2 mmol/L l-glutamine, 15 mmol/L HEPES, 10−4 mmol/L hypoxanthine (Life Technologies), and 2 μg/ml azaserine (O-diazoacetyl-l-serine; Sigma, St. Louis, MO) and placed in a 37°C incubator with 9% CO2. When visible hybridoma colonies were apparent, flow cytometric analysis was used to screen supernatants from these wells for Ab secretion and for nonreactivity (≤1% positive cells) to PBMC. Briefly, a mixture of rat anti-mouse κ mAb-conjugated polystyrene beads (2.5 μm in diameter; Interfacial Dynamics, Portland, OR) and PBMC was incubated with 50 μl of hybridoma supernatant for 20 min at room temperature. The bead/cell mixture was then washed twice with PBS, pH 7.4, containing 5 mmol/L EDTA and 0.5% BSA (PBS/EDTA/BSA), and binding of mouse IgM, IgG1, Ig2a, and Ig2b from the supernatants to the beads and the test cells was detected by staining with PE-conjugated rat anti-mouse IgM mAb (clone X54; BD Biosciences, San Jose, CA), rat anti-mouse IgG1 mAb (clone X56; BD Biosciences), and rat anti-mouse IgG2 mAb (clone X57; BD Biosciences). Culture supernatants that fulfilled the screening criteria of the first round were then flow cytometrically screened for reactivity to a significant proportion of BDC. Briefly, a mixture of rat anti-mouse κ mAb-conjugated polystyrene beads and enriched BDC (PBMC depleted of B cells, T cells, and monocytes) was incubated with 50 μl of hybridoma culture supernatant for 20 min at room temperature. The mixture was then washed twice with PBS/EDTA/BSA and stained with PE-conjugated rat anti-mouse IgM mAb, rat anti-mouse IgG1 mAb, and rat anti-mouse IgG2 mAb to detect binding of mouse IgM, IgG1, Ig2a, and Ig2b from the supernatants to the beads and the enriched BDC. For discrimination of HLA-DR+ BDC from HLA-DR− cells, the bead/cell mixture was then washed once, free binding sites of the PE-conjugated rat anti-mouse IgG2 mAb and the bead-conjugated rat anti-mouse κ mAb were saturated by incubation with 100 μg/ml mouse IgG2a, and the mixture was counterstained with anti HLA-DR-FITC (clone AC122, IgG2a). Selected hybridoma cells were expanded, subclones were established, and the isotype of the mAb was determined by the ISOTYPE Ab-STAT Kit (SangStat Medical, Palo Alto, CA). Buffy coats from normal healthy volunteers were obtained form the Institute for Transfusionmedicine, Hospital Merheim (Cologne, Germany). PBMC were prepared from buffy coats by standard Ficoll-Paque (Pharmacia, Uppsala, Sweden) density gradient centrifugation. Peripheral blood leukocytes were prepared from buffy coats by lysis of erythrocytes in isotonic ammonium chloride buffer. CD4+ lin− BDC were isolated from PBMC by two-step immunomagnetic cell sorting (MACS) as described in detail previously (13, 20). Briefly, monocytes, T cells, B cells, and NK cells were depleted using mAb against CD3 (clone BW264/56), CD11b (clone M1/70.15.11.5), CD16 (clone VEP-13), and in a few experiments a poorly defined Ag expressed on B cells and monocytes (clone L179; BD Biosciences). From the depleted cell fraction, BDC were then enriched using an mAb against CD4 (clone M-T321). To screen hybridoma culture supernatants (see above), BDC were merely partially enriched by immunomagnetic depletion of T cells, B cells, and monocytes based on CD3 and L179 Ag expression. CD1c-, BDCA-2-, and BDCA-3-expressing cells were isolated from PBMC by indirect magnetic labeling with PE- or FITC-conjugated mAb (AD5-8E7, AC144, and AD5-5E8, respectively) and anti-PE or anti-FITC mAb-conjugated microbeads (Miltenyi Biotec) and enrichment of labeled cells by MACS. In some experiments BDCA-3+ cells were isolated based on direct magnetic labeling with anti-BDCA-3 mAb (AD5-5E8)-conjugated microbeads. Highly pure CD1c+ BDC without contaminating CD1c+ B cells were obtained by immunomagnetic depletion of CD19+ B cells using CD19 mAb-conjugated microbeads (Miltenyi Biotec) followed by immunomagnetic enrichment of CD1c+ cells. Basophils were purified from PBMC by immunomagnetic depletion of nonbasophils based on indirect magnetic labeling of CD3-, CD7-, CD14-, CD15-, CD36-, CD45RA-, and HLA-DR-expressing cells with a magnetic labeling kit (Miltenyi Biotec). CD14+ monocytes, CD34+ hemopoietic progenitor cells, and CD3+ T cells were immunomagnetically purified based on direct magnetic labeling with CD14, CD34, and CD3 mAb-conjugated microbeads (Miltenyi Biotec), respectively. For generation of immature monocyte-derived DC (Mo-DC), purified CD14+ monocytes were cultured at a cell density of 5 × 105 to 1 × 106 cells/ml in medium (RPMI 1640 (Life Technologies) supplemented with 2 mmol/L l-glutamine, 10% FCS (Sigma), 110 mg/L sodium pyruvate (Life Technologies), 100 U/ml penicillin (Life Technologies), and 100 μg/ml streptomycin (Life Technologies)) at 37°C in a humidified 5% CO2-containing atmosphere in the presence of 500-1000 U/ml rIL-4 (PeproTech, Rocky Hill, NJ) and 100 ng/ml rGM-CSF (PeproTech) for 7 days. For generation of mature Mo-DC, immature Mo-DC were washed once and cultured in medium in the presence of 20 ng/ml TNF-α (PeproTech) for another 3 days. For generation of CD34+ hemopoietic progenitor cell-derived DC (CD34-derived DC), purified CD34+ cells were cultured at a cell density of 5 × 104 cells/ml in medium in the presence of 100 ng/ml rFlt3 ligand (PeproTech), 0.5 ng/ml rTGF-β1 (PeproTech), 10 ng/ml rTNF-α, 20 ng/ml recombinant stem cell factor (PeproTech), and 100 ng/ml rGM-CSF for 11 days. Freshly isolated CD4+ lin− BDC were cultured at a cell density of 5 × 105 to 1 × 106 cells/ml in medium in the presence of 10 ng/ml rIL-3 (PeproTech) for up to 48 h. Isolated CD1c-, BDCA-2-, and BDCA-3-expressing BDC were cultured at a cell density of 5 × 105 to 1 × 106 cells/ml in medium without any cytokines or in the presence of 10 ng/ml rIL-3, 20 ng/ml IL-4 (PeproTech), and 100 ng/ml GM-CSF for up to 48 h.
A FACScalibur (BD Biosciences) was used for one-, two-, three-, or four-color flow cytometry. Data for 5 × 103 to 2 × 105 cells/sample were acquired in list mode and analyzed using CellQuest software (BD Biosciences). The following mAb (clone names) were used in this study for flow cytometry: CD1a (HI149), CD10 (HI10a), CD11a (G43-25B), CD11c (B-ly6), CD25 (M-A261), CD27 (M-T271), CD32 (FL18.26), CD38 (HIT2), CD40 (5C3), CD43 (1G10), CD54 (HA58), CD62L (Dreg 56), CD64 (10.1), CD69 (FN50), CD98 (HIM6), anti-HLA-DQ (Tü169), and anti-TCRαβ (T10B9.1A-31) from PharMingen (San Diego, CA); CD2 (S5.2), CD8 (SK1), CD13 (L138), CD14 (MFP9), CD19 (SJ25-C1), CD33 (P67.6), CD34 (8G12), CD45RO (UCHL-1), CD56 (NCAM16.2), CD62L (SK11), CD71 (L01.1), CD123 (9F5), anti-IgD (TA4.1), anti-mouse IgG1 (X56), anti-mouse IgG2 (X57), and anti-mouse IgM (X54) from BD Biosciences; CD5 (CLB-T11/1, 6G4), CD7 (CLB-T-3A1/1, 7F3), CD16 (CLB-FcR Gran1, 5D2), CD45RA (F8-11-13), and CD80 (CLB-DAL1) from CLB (Amsterdam, The Netherlands); CD18 (7E4), CD23 (9P25), CD58 (AICD58), CD77 (38.13), CD83 (HB15A), CD86 (HA5.2B7), and CD116 (SC06) from Coulter-Immunotech (Marseilles, France); CD3 (BW264/56), CD4 (M-T321), CD11b (M1/70.15.11.5), CD14 (TUK4), CD15 (VIMC6), CD16 (VEP-13), anti-HLA-DR (910/D7), anti-AC133 (AC133/1), and anti-TCRαβ (BW242/412) from Miltenyi Biotec; CD36 (AC106), CD123 (AC145), anti-HLA-DR (AC122 and AC123), and anti-glycophorin A (AC107) from Amcell (Sunnyvale, CA); CD1c (M241) from Ancell (Bayport, MN); polyclonal anti-IgG, anti-IgM (SA-DA4), polyclonal anti-κ, and polyclonal anti-λ from Southern Biotechnology Associates (Birmingham, AL); CD61 (VIPL2) from W. Knapp (Institute of Immunology, University of Vienna, Vienna, Austria); CD44 (IM7) from J. Moll (Forschungszentrum Karlsruhe, Karlsruhe, Germany); CD20 (HI47) from Caltag (Burlingame, CA); anti-CLA (HECA-452) from E. Butcher (Department of Pathology, Stanford University, Stanford, CA); anti-FcεRI (15-1) from J. P. Kinet (Molecular Allergy and Immunology Section, National Institute of Allergy and Infectious Diseases, National Institutes of Health, Bethesda, MD); CD11c (Ki-M1) from M. R. Parwaresch (Department of Pathology, Christian Albrechts University, Kiel, Germany); CMRF-44 and CMRF-56 from D. N. Hart (Mater Medical Research Institute, Mater Misericordiae Hospitals, South Brisbane, Australia); and anti HLA-A,B,C (W6/32) from Sigma. All Abs were used as FITC-, PE-, biotin-, or Cy5-conjugated mAb. For indirect immunofluorescent staining with biotinylated mAb, streptavidin-APC (BD Biosciences) was used. For exclusion of dead cells in the flow cytomeric analysis, cells were stained with propidium iodide. 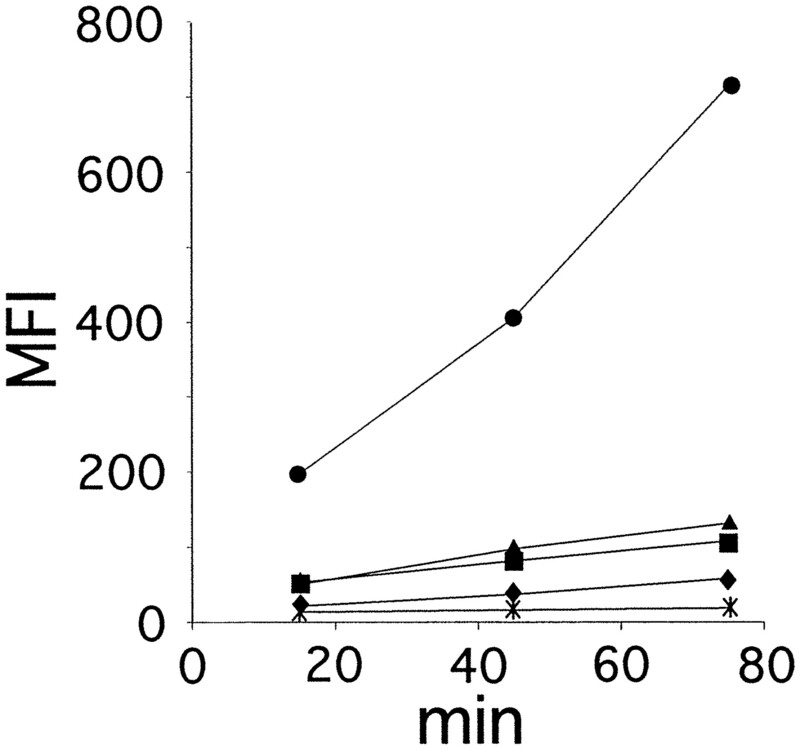 To minimize FcR-mediated mAb binding, cells were stained in most experiments in the presence of FcR-blocking reagent (Miltenyi Biotec) containing human IgG. Cells were spun down on slides in a cytocentrifuge (Cytospin 3; Shandon, Pittsburgh, PA). A Zeiss Axioscope microscope (Zeiss, Oberkochen, Germany) was used for analysis. Digital pictures were made using the Xillix MicroImager MI1400-12X (Xillix, Vancouver, Canada). To assess endocytosis of BDC subsets, purified CD1c+, BDCA-2+, and BDCA-3+ BDC, and (as controls) purified CD3+ T cells and immature Mo-DC were incubated at 37°C in medium with 1 mg/ml Lucifer Yellow (LY) for 0, 15, 45, and 75 min. Afterward, cells were washed three times in ice-cold PBS/EDTA/BSA and analyzed by flow cytometry. The mAb listed in Table I⇓ fulfilled the initial screening criteria for BDC-specific mAb (see Materials and Methods) and were further characterized. According to their reactivity with blood cells, the mAb could be divided into four groups: 1) AC144, AD5-13A11, and AD5-4B8; 2) AD5-17F6; 3) AD5-5E8 and AD5-14H12; and 4) AD5-8E7. The mAb of the first group, AC144, AD5-13A11, and AD5-4B8, stain 0.41 ± 0.17% (n = 10) of all PBMC (Fig. 1⇓A). In a dot plot of forward and side scatter signals, these rare cells constitute a homogeneous cell population that is located between small resting lymphocytes and monocytes (Fig. 1⇓B). Accordingly, these rare cells do not express TCRαβ, CD14, CD19, and CD56 (Fig. 1⇓A), lineage markers that are expressed on T cells, monocytes, B cells, and NK cells, respectively. Staining of highly purified BDC (>95% HLA-DR+, TCRαβ−, CD14−, CD19−, and CD56−) with CD123-PE vs CD11c-FITC reveals three BDC subsets (Fig. 2⇓): 1) CD11c− CD123bright BDC, 2) CD11cbright CD123dim BDC, and 3) CD11c+ CD123− BDC. The mAb of the first group clearly stained all CD11c− CD123bright BDC, but, except for a very few cells, not the CD11c+ BDC (Fig. 2⇓). To analyze whether all mAb of the first group react with a single Ag, we performed two-color stainings and cross-inhibition studies (data not shown). The results showed that all mAb of this group recognize a single epitope of the same Ag. We named this Ag BDCA-2. Expression of BDCA-2, BDCA-3, and CD1c (BDCA-1) on PBMC. A, Staining of PBMC with FITC-conjugated mAb against BDCA-2 (AC144), BDCA-3 (AD5-5E8), and CD1c (AD5-8E7) and with PE-conjugated mAb against the TCRαβ heterodimer, CD14, CD19, and CD56, respectively. The numbers indicate the percentage of cells in the respective quadrant. Propidium iodide fluorescence and light scatter signals were used for gating of live cells. 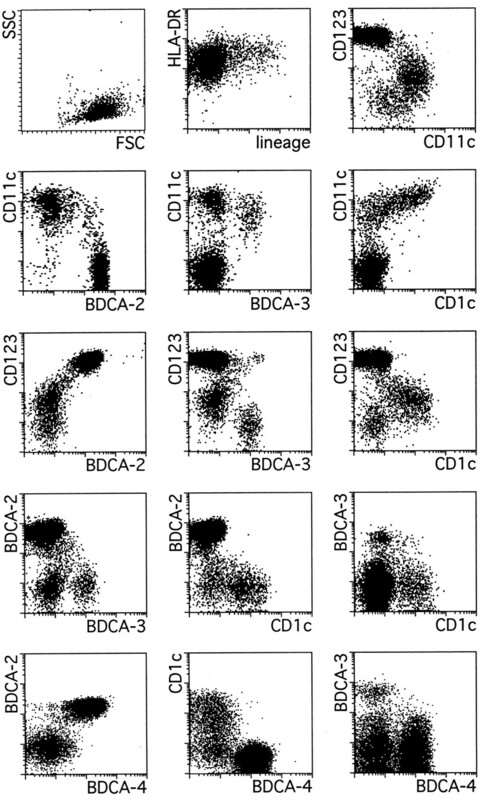 B, Scatter profile of PBMC (a), gated BDCA-2+ cells (b), gated BDCA-3+ cells (c), and gated CD1c+ cells (d). BDCA-2, BDCA-3, BDCA-4, and CD1c (BDCA-1) are expressed on three distinct subsets of BDC. BDC were isolated from PBMC by depletion of CD3-, CD11b-, and CD16-positive cells followed by enrichment of CD4-positive cells. 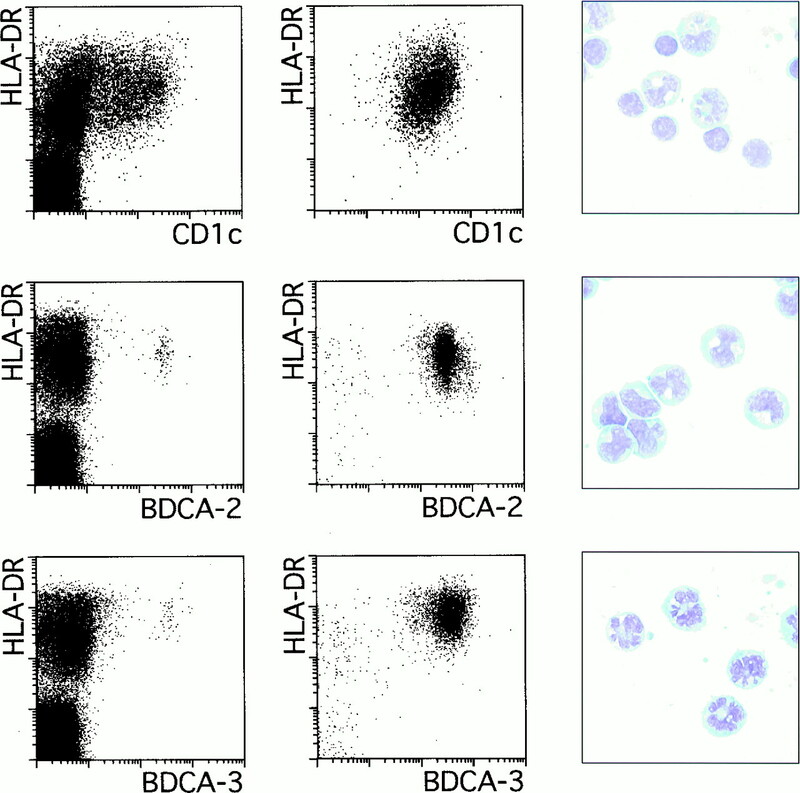 The purity of BDC is demonstrated by light scatter properties (upper left dot plot) and anti-HLA-DR-Cy5 vs anti lin-FITC (anti-TCRαβ, CD14, CD19, and CD56) staining (upper middle dot plot). Note that only a few lin+ cells are present. Expression of BDCA-2, BDCA-3, BDCA-4, and CD1c on BDC is characterized in a series of two-color stainings with PE- and FITC-conjugated mAb against CD11c, CD123, and the Ags themselves. Note that BDCA-2, BDCA-3, BDCA-4, and CD1c are almost exclusively expressed on only one of three distinct BDC subsets each. The subsets are defined according to staining of BDC with CD123-PE vs CD11c-FITC (upper right dot plot): 1) CD11c− CD123bright BDC, 2) CD11cbright CD123dim BDC, and 3) CD11c+ CD123− BDC. As shown in Fig. 3⇓, the mAb of the second group, AD5-17F6, recognizes the same cells among PBMC as AC144, one of the BDCA-2-specific mAb of the first group. Nevertheless, AD5-17F6 stains an Ag that is different from BDCA-2. This was unequivocally demonstrated by cointernalization experiments, where AD5-17F6 showed surface staining with equal intensity before and after anti-BDCA-2 mAb-mediated internalization of BDCA-2 (data not shown), and by staining of BDC after culture, where AC144 mAb and AD5-17F6 mAb showed entirely different staining patterns (see below and Fig. 4⇓). The Ag recognized by AD5-17F6 was named BDCA-4. Expression of BDCA-4 on PBMC. Shown is a two-color staining of PBMC with FITC-conjugated mAb against BDCA-2 (AC144) and with PE-conjugated mAb against BDCA-4 (AD5-17F6). Note that almost no single-positive (BDCA-2+ BDCA-4− and BDCA-2− BDCA-4+) PBMC are detected. Expression of BDCA-2, BDCA-3, and BDCA-4 on purified BDC after various periods of culturing in the presence of IL-3. A, Histograms show staining of gated CD11c− and CD11c+ BDC with PE-conjugated anti-BDCA-2 mAb (AC144) and anti-BDCA-4 mAb (AD5-17F6; bold lines) and with PE-conjugated isotype-matched control mAb (faint lines), respectively. Dot plots show staining of BDC with CD11c-PE vs anti BDCA-3 (AD5-5E8)-biotin/streptavidin-APC. B, Diagrams show mean fluorescence intensity (MFI) values for anti-BDCA-2-PE, anti-BDCA-4-PE, and anti-BDCA-3-biotin/streptavidin-APC staining of CD11c (▴) and CD11c+ (▪) BDC, respectively. For BDCA-2 and BDCA-4, MFI values were calculated by subtracting the values obtained with isotype control mAb from the values obtained with the AC144 and AD5-17F6 mAb, respectively. For BDCA-3, MFI values are calculated by subtracting the values obtained without any staining mAb (autofluorescence) from the values obtained with AD5-5E8 mAb. The mAb of the third group, AD5-5E8 and AD5-14H12, stained 0.04 ± 0.01% (n = 10) of all PBMC (Fig. 1⇑A). According to scatter signals (Fig. 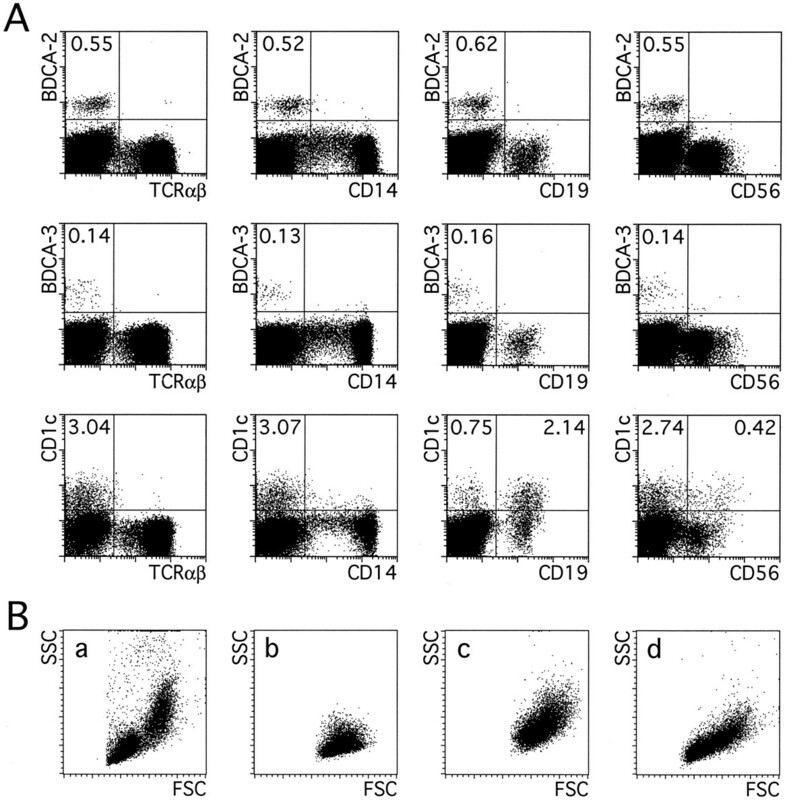 1⇑B) and counterstaining with mAb against TCRαβ, CD14, CD19, and CD56 (Fig. 1⇑A), these cells are distinct from lymphocytes and monocytes and are slightly larger than the cells recognized by the Abs of the first group. Accordingly, staining of BDC shows that a different subset is recognized by AD5-5E8 and AD5-14H12, namely CD11c+ CD123− BDC (Fig. 2⇑). According to two-color stainings, cross-blocking studies and cocapping experiments (data not shown), both mAb appear to recognize two spatially unrelated epitopes of the same Ag. We named this Ag BDCA-3. The fourth group mAb AD5-8E7 reacts with 2.39 ± 0.76% (n = 10) of unfractionated PBMC (Fig. 1⇑A). Light scatter analysis (Fig. 1⇑B) and counterstaining of the lineage markers TCRαβ, CD14, and CD19 revealed that the mAb is not reactive to T cells and monocytes, but is reactive to a major subset of small resting CD19+ B cells. Staining of purified BDC shows that AD5-8E7, in addition to B cells, stains a third subset of BDC distinct from those subsets recognized by the mAb of the first and second groups, namely CD11cbright CD123dim BDC. A significant proportion of the CD11cbright CD123dim BDC expresses CD56 (see below). For this reason, some AD5-8E7-reactive PBMC stain for CD56 (Fig. 1⇑A). AD5-8E7 is not reactive to purified NK cells (data not shown). The Ag recognized by AD5-8E7 was initially named BDCA-1, as it appeared to be a new Ag. However, it later transpired that AD5-8E7 completely blocked binding of the CD1c mAb M241 to MOLT-4 cells (Fig. 5⇓). Thus, the Ag recognized by AD5-8E7 is CD1c. The BDCA-1-specific mAb AD5-8E7 blocks binding of the CD1c mAb M241 to MOLT-4 cells. MOLT-4 cells were preincubated with saturating amounts of AD5-8E7 mAb (bold line) or an isotope control mAb (faint line) and then stained with PE-conjugated CD1c mAb (M241). None of the mAb listed in Table I⇑ is reactive to granulocytes, platelets, erythrocytes, purified basophils, or purified CD34+ hemopoietic progenitor cells (data not shown). Expression of BDCA-2, BDCA-3, and BDCA-4 on CD11c− and CD11c+ BDC was analyzed after various periods of culturing total BDC in the presence of rIL-3. The results are shown in Fig. 4⇑. Expression of BDCA-2 is completely down-regulated within 48 h on CD11c− BDC. In contrast, BDCA-4 is even further up-regulated on CD11c− BDC and, unlike BDCA-2, is also expressed to a high level on most, if not all, CD11c+ BDC. Expression of BDCA-3 is rapidly induced on CD11c− BDC, reaching the highest expression level after 24 h. Thereafter, BDCA-3 expression appears to be down-regulated again. Analyzing the expression of BDCA-3 on CD11c+ BDC is complicated by the fact that BDCA-3− CD11cbright and BDCA-3+ CD11c+ subsets are present at the onset of the culture. Expression of BDCA-3 appears to remain unchanged at least until 6 h of culture on the BDCA-3+ CD11c+ BDC population and is induced within 3 h on at least some cells of the BDCA-3− CD11cbright BDC subset. Functional CD1a+ DC can be generated ex vivo from monocytes (21, 22, 23) and CD34+ hemopoietic progenitor cells (24). Fig. 6⇓ shows that immature Mo-DC (25, 26) and CD34-derived DC express CD1a, CD1c, and BDCA-4, but not BDCA-2 or BDCA-3. Expression of BDCA-2, BDCA-3, and BDCA-4 on immature Mo-DC and CD34-derived DC. Immature Mo-DC (A) and CD34-derived DC (B) were stained with CD1a-FITC, CD1c-PE (AD5-8E7), anti-BDCA-2-PE (AC144), anti-BDCA-3-PE (AD5-5E8), and anti-BDCA-4-PE (AD5-17F6), respectively (bold lines). The faint lines show staining with isotype control mAb. 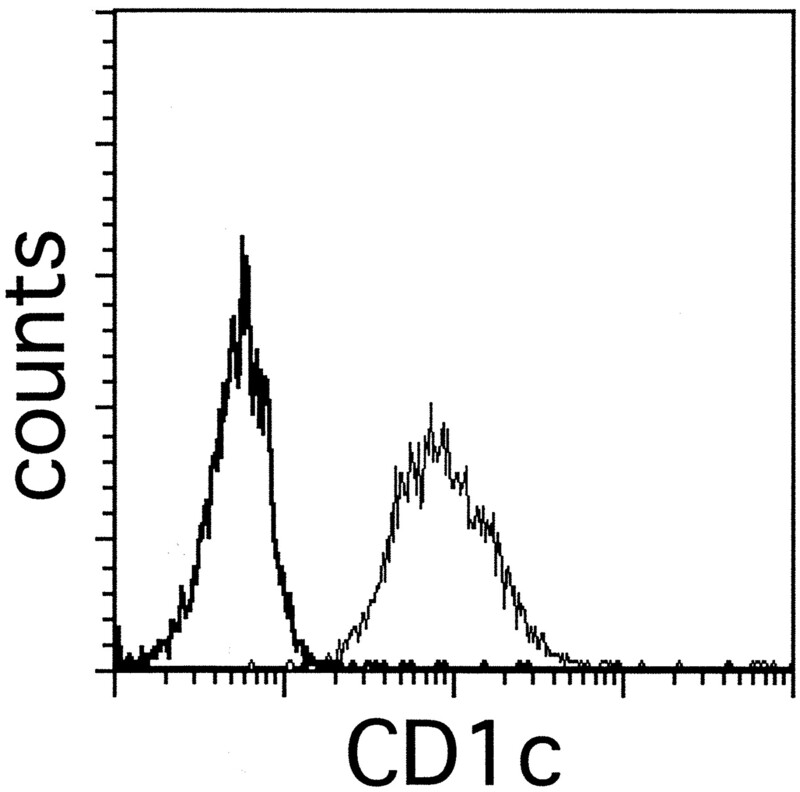 Except for the left-most histogram (CD1a staining), gated CD1a+ cells are shown in B. The possibility that 37°C incubation of anti-BDCA-2 mAb-labeled BDCA-2+ cells results in mAb internalization was addressed by staining of PBMC with FITC-conjugated AC144 mAb (IgG1). Then, following incubation at 37°C, the remaining cell surface-associated mAb was detected by staining with PE-conjugated rat anti-mouse IgG1 mAb. As shown in Fig. 7⇓, when cells were incubated at 37°C, the intensity of the rat anti-mouse IgG1-PE staining decreased extremely rapidly to background levels. 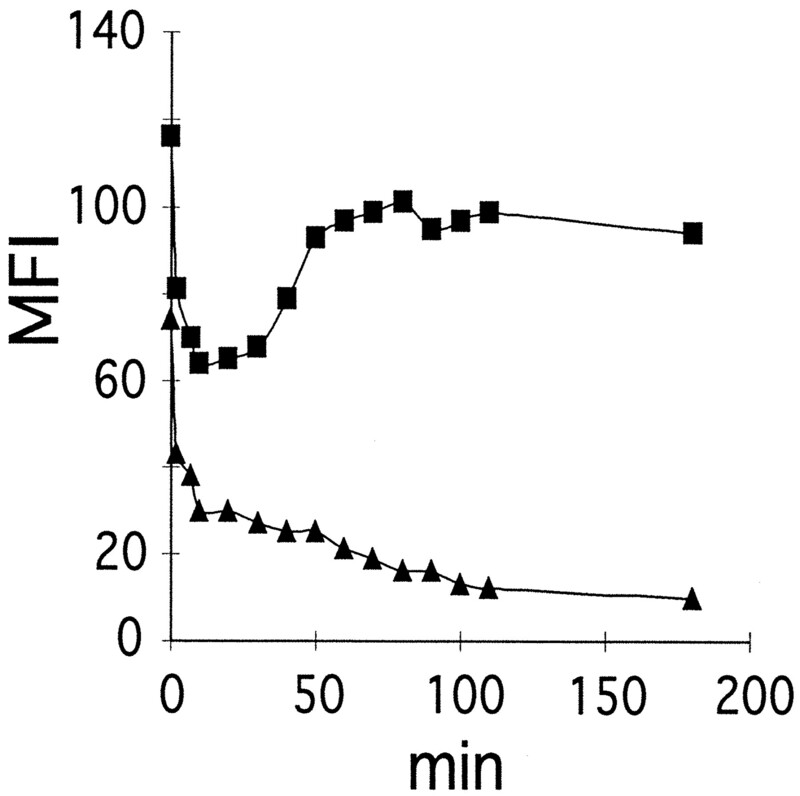 In contrast, the intensity of the AC144-FITC staining decreased only temporarily to a level of ∼50%, but thereafter nearly returned to the preincubation level. This demonstrates that BDCA-2 is internalized upon anti-BDCA-2 mAb labeling, with kinetics similar to those of receptor-mediated endocytosis. The transient decrease in AC144-FITC staining intensity is probably due to patching and capping of the BDCA-2/anti-BDCA-2 mAb complex before endocytosis. Culture of anti-BDCA-2 mAb-labeled BDCA-2+ cells results in rapid mAb internalization. PBMC were labeled at 4°C with FITC-conjugated anti-BDCA-2 mAb (AC144, IgG1), incubated at 37°C for the periods indicated, and then stained at 4°C with PE-conjugated rat anti-mouse IgG1 mAb (X56) and Cy5-conjugated CD123 mAb (AC145, IgG2a). Shown are mean fluorescence intensity (MFI) values of anti BDCA-2-FITC (▪) and rat anti-mouse IgG1 mAb-PE (▴) staining of gated BDCA-2+ CD123+ cells. CD1c+, BDCA-2+, and BDCA-3+ cells were isolated from PBMC by MACS (Fig. 8⇓). On May-Grünwald Giemsa staining of cytocentrifuge slides (Fig. 8⇓), freshly isolated BDCA-2-expressing cells displayed the typical lymphoplasmacytoid morphology of CD11c− CD4+ lin− DC from blood and tonsils: that is, medium-sized round cells with oval or indented nuclei (3, 6, 16). In contrast, both freshly isolated CD1c+ BDC as well as freshly isolated BDCA-3+ BDC displayed the typical morphological characteristics of CD11c+ CD4+ lin− DC from blood or tonsils: that is, less rounded cells with short cell processes and more hyperlobulated nuclei (3, 19). In addition to CD1c+ BDC, CD1c+ B cells with the typical morphology of small resting lymphocytes can be seen on the cytocentrifuge slides of isolated CD1c+ PBMC. Highly pure CD1c+ BDC were obtained if, before the enrichment of CD1c+ cells, CD19+ B cells were magnetically depleted from PBMC (data not shown). Morphology of immunomagnetically purified CD1c+, BDCA-2+, and BDCA-3+ BDC. CD1c+, BDCA-2+, and BDCA-3+ cells were isolated from PBMC by indirect magnetic labeling with PE-conjugated primary mAb (AD5-8E7, AC144, and AD5-5E8) and anti-PE mAb-conjugated microbeads followed by enrichment of labeled cells by MACS. The dot plots show staining of PBMC with HLA-DR-FITC and the PE-conjugated mAb before (left dot plots) and after (right dot plots) magnetic enrichment of CD1c+ (upper dot plots), BDCA-2+ (middle dot plots), and BDCA-3+ (lower dot plots) cells, respectively. The three pictures on the right show May Grünwald/Giemsa staining of isolated CD1c+ (upper picture), BDCA-2+ (middle picture), and BDCA-3+ cells after cytocentrifugation. Note that small lymphocytes can be seen in the picture of the enriched CD1c+ cells. These are CD1c+ B cells. The phenotypes of fresh CD1c+, BDCA-2+, and BDCA-3+ BDC were analyzed by two-color (BDCA-2+ and BDCA-3+ BDC) or three-color (CD1c+ BDC) immunofluorescence, respectively. The results of the phenotypic analysis are shown in Table II⇓ and can be summarized as follows. None of the BDC subsets expressed CD1a, CD8, CD15, CD16, CD19, CD20, CD23, CD25, CD27, CD34, CD61, CD69, CD71, CD77, CD80, CD83, glycophorin A, TCRαβ, AC133, IgD, IgM, or the CMRF-56 Ag. All BDC subsets expressed CD43, CD44, CD54, and MHC class I molecules at similar levels. BDCA-2+ BDC differed from the other two subsets in that they did not express CD13, CD40, CD45RO, and CD56, but did express CD45RA and small amounts of CD10, and in that they expressed lower levels of CD18, CD38, CD58, CD98, CD116, and CLA, but higher levels of CD4. Minor proportions of BDCA-2+ BDC are CD2 and CD7 positive, respectively. CD1c+ BDC differ from the other two subsets in that they express higher levels of MHC class II molecules, but lower levels of CD62L, and in that they are all positive for CD2 and the Fc receptors CD32, CD64, and FcεRI. Probably due to the Fc receptor expression, CD1c+ BDC are also positive for IgG, κ and λ. Furthermore, some CD1c+ BDC are positive for CD14 and CD11b, whereby the level of expression inversely correlates with the level of both CD1c and CD2 expression (data not shown). BDCA-3+ BDC differ from the other two subsets in that they express CD36 at a much lower level, and they appear to express low levels of CD5. Finally, apart from CD11c and CD123, at least one additional Ag, CD33, is useful for discrimination of all three subsets: CD33 is expressed at low levels on BDCA-2+ BDC, at intermediate levels on BDCA-3+ BDC, and at high levels on CD1c+ BDC. Freshly isolated CD1c+ BDC and BDCA-3+ BDC were cultured for 2 days in medium without any supplemented cytokines, and freshly isolated BDCA-2+ BDC were cultured for 1 day in medium supplemented with IL-3 and CD40 mAb on CD32-transfected fibroblasts. After the culture period, cells were analyzed for the expression of CD1a, CD80, CD83, CD86, and HLA-DR. For the purpose of comparison, immature Mo-DC and mature Mo-DC were also included (25, 26). As shown in Fig. 9⇓, in contrast to immature Mo-DC and mature Mo-DC, none of the BDC subsets expressed CD1a after the culture period. However, the costimulatory molecules CD80 and CD86, the dendritic cell activation Ag CD83 (27), and HLA-DR molecules were up-regulated upon culturing all three BDC subsets to a similar level compared with mature Mo-DC. The results were not significantly different in another experiment in which all three BDC subsets were cultured for 2 days in medium supplemented with IL-3, IL-4, and GM-CSF (data not shown). Up-regulation of MHC class II, CD83, and costimulatory molecules on CD1c+, BDCA-2+, and BDCA-3+ BDC upon culturing. Purified CD1c+ (A), BDCA-3+ (B), and BDCA-2+ BDC (C) were cultured for 2 days in medium (CD1c+ and BDCA-3+ BDC) or for 1 day in medium with rIL-3 and anti-CD40 mAb on CD32-transfected L cells (BDCA-2+ BDC), respectively. Immature Mo-DC (D) and mature Mo-DC (E) were generated as described in Materials and Methods. 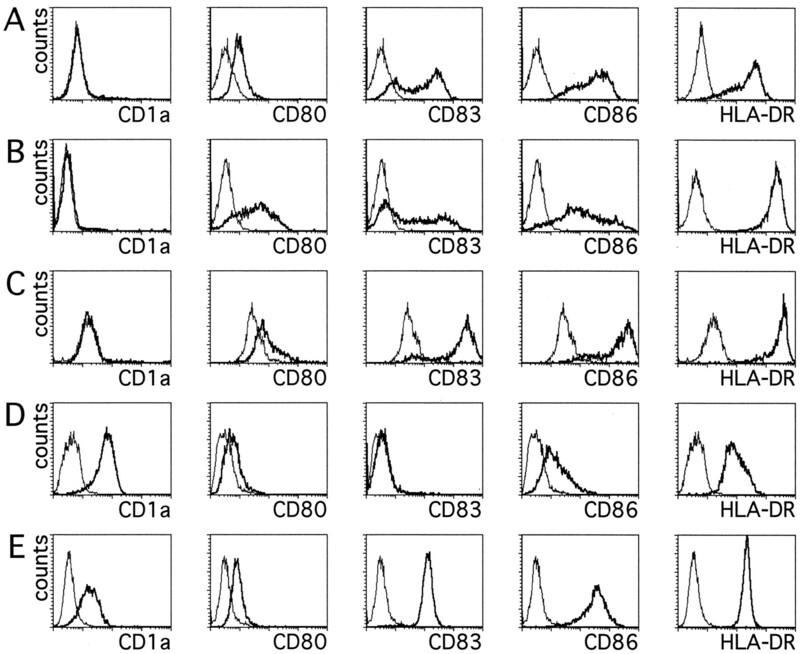 The histograms show cell staining with CD1a-FITC, CD80-PE, CD83-PE, CD86-PE, and HLA-DR-PE, respectively (bold lines). The faint lines show cell staining with fluorochrome-matched control mAb. The endocytic capacity of purified CD1c+, BDCA-2+ and BDCA-3+ BDC, and, as controls, purified CD3+ T cells and immature Mo-DC was examined by culturing the cells at 37°C in the presence of LY and analyzing the uptake of LY after various periods by flow cytometry. As shown in Fig. 10⇓, unlike purified CD3+ T cells, purified CD1c+ BDC, BDCA-3+ BDC, and to some extent BDCA-2+ BDC have the ability to endocytose LY. Similar results were obtained using FITC-dextran (data not shown). The endocytic capacities of all BDC populations are much lower if compared with immature Mo-DC. Endocytic capacity of freshly isolated CD1c+, BDCA-2+, and BDCA-3+ BDC in comparison with purified CD3+ T cells and immature Mo-DC. CD1c+ BDC (▴), BDCA-2+ BDC (♦), BDCA-3+ BDC (▪), CD3+ T cells (∗), and immature Mo-DC (•) were incubated at 37°C in medium with 1 mg/ml LY for the periods indicated, washed three times in ice-cold PBS/EDTA/BSA, and then analyzed by flow cytometry. Shown are the mean fluorescence intensity (MFI) values for LY fluorescence after subtracting the MFI values that were obtained upon incubation at 4°C in the absence of LY. Several attempts to generate mAb specific for human BDC have failed, yielding only mAb that bind Ags expressed by both BDC and other leukocytes. Human BDC share a large number of immunogenic cell surface structures with other blood cells. These Ags may dominate the immune response to injected BDC to a level where B cells with specificity for BDC-specific Ags are not at all or are only very rarely represented among B cells that have the capability to fuse with myeloma cells. Many investigators have tried to overcome this problem by injecting adult mice with non-BDC and cyclophosphamide to ablate B cells with specificity for shared Ags or by injecting neonatal mice with non-BDC to tolerize B cells with specificity for shared Ags (28, 29). Here, we have approached this problem with a recently described contralateral footpad immunization procedure (30). This system is based on the fact that naive Ag-specific T and B cells continuously recirculate among peripheral lymphoid organs as long as they do not encounter Ag (31, 32, 33, 34), but become immediately retained within a peripheral lymphoid organ for several days, if not weeks, once they are activated by Ag (35, 36, 37, 38). Therefore, in our example, the left footpads of mice were injected on days −3, 0, 4, 7, 11, and 14 with Bristol-8 B lymphoblastoma cells, while the right footpads were injected with BDC on days 0, 4, 7, 11, and 14. Naive B and T cells with specificity for shared Ags, e.g., HLA class II molecules, should become activated by Bristol-8 cells between days −3 and 0 in the left popliteal lymph node and thereupon be retained there, while all lymphocytes with specificity for Ags unique to BDC should remain available for activation after day 0 in the right popliteal lymph node. This immunization technique combined with a powerful procedure for rapid isolation of large numbers of BDC has permitted us to produce a panel of mAb that recognize three presumably novel BDC Ags: BDCA-2, BDCA-3, and BDCA-4. We found that in noncultured human blood BDCA-2 and BDCA-4 are exclusively expressed by a CD123bright CD11c− DC population. This DC population is now commonly referred to as plasmacytoid BDC (4, 5, 6, 7, 10, 14, 16). Using BDCA-2 or BDCA-4 as a surface marker for immunomagnetic isolation and/or flow cytometric identification of plasmacytoid BDC, our results on frequency, immunophenotype, morphology, endocytic capacity, and maturation of these cells were consistent with most previous reports where a large panel of leukocyte Ags was used (3, 4, 5, 6, 7, 8, 10, 14). This clearly illustrates that both Ags are useful markers for plasmacytoid BDC in noncultured human blood. Preliminary results from stainings of tonsilar cells indicate that the T cell zone-associated plasmacytoid DC in peripheral lymphoid organs can also be discriminated from other lymphoid tissue-associated DC populations, such as germinal center DC, interdigitating DC, and follicular DC based on the expression of BDCA-2 and BDCA-4 (data not shown). Concerning this point it is interesting that, unlike BDCA-2, BDCA-4 is also expressed on several in vitro differentiated DC populations: 1) in contrast to BDCA-2, BDCA-4 is expressed on both Mo-DC and CD34-derived DC; 2) whereas expression of BDCA-2 is completely down-regulated on plasmacytoid BDC once they have undergone IL-3-mediated maturation in culture, expression of BDCA-4 is, in fact, up-regulated on cultured plasmacytoid BDC; and 3) in contrast to BDCA-2, BDCA-4 is expressed within 12 h by a majority of cultured CD11c+ BDC, although it is unclear whether this is only true for the larger CD1c+ CD11cbright population or is also true for the smaller CD1c− CD11c+ CD123− population. The finding that no other BDCA-4+ cells than plasmacytoid BDC appear to be present in noncultured human blood, in fact, indicates that no counterparts of the in vitro differentiated BDCA-4+ DC populations are present in blood. Labeling of BDCA-2 by anti-BDCA-2 mAb and incubation at 37°C induce rapid internalization of the Ag-mAb complex. In analogy to other endocytic receptors on DC that are down-regulated upon maturation, such as langerin (39), it is tempting to speculate that BDCA-2 may be a receptor with Ag capture function. Expression of BDCA-3 was found to be restricted to a small population of CD1c− CD11c+ CD123− BDC in noncultured human blood. With respect to phenotype, morphology, endocytic capacity, and maturation requirements, this BDC population is quite similar to the CD1c+ CD11cbright CD123dim BDC population. However, apart from BDCA-3 and CD1c expression, our immunophenotypic analysis has revealed some striking differences: in contrast to CD1c+ BDC, BDCA-3+ BDC do not express the Fc receptors CD32, CD64, and FcεRI, and they do not express CD2. The lack of Fc receptor expression indicates that BDCA-3+ BDC, unlike CD1c+ BDC (40, 41), do not have the capability of Ig-mediated Ag uptake. In principle, BDCA-3+ BDC and CD1c+ BDC may represent maturational stages of the same cell type or unrelated DC types. The fact that BDCA-3 expression is induced on a reasonable proportion of CD1c+ BDC after culture-induced maturation may be considered an argument in favor of the former concept, but because the same observation was also made for IL-3-stimulated plasmacytoid BDC, such data could also be taken as an argument in favor of a similar relationship between BDCA-3+ BDC and plasmacytoid BDC. A recent study by Ito et al. (7) has provided evidence that CD1c+ CD11cbright BDC, in contrast to CD1c− CD11c+ BDC, have the capacity to acquire Langerhans cell characteristics (expression of Lag Ag, E-cadherin, and langerin, and presence of Birbeck granules) when cultured with GM-CSF, IL-4, and TGF-β1. If BDCA-3+ BDC and CD1c+ BDC represent maturational stages of the same cell type, this would indicate that BDCA-3+ BDC have either already lost or not yet acquired the capacity to differentiate into Langerhans cells. In contradiction to our results, Ito et al. (7) have reported that CD1c+ CD11cbright BDC, unlike CD1c− CD11c+ BDC, express CD1a. This is, in fact, more than doubtful. The authors stated that they have used the two mAb, BL-6 and B-B5, for staining of CD1a and that a difference in staining intensity was actually observed when the two mAb were compared (staining with B-B5 was probably brighter). We found that staining of BDC was clearly negative using optimal titers of the CD1a mAb BL-6 and HI149, but positive using B-B5. Moreover, it turned out that B-B5, unlike BL-6 and HI149, stained a high proportion of CD19+ B cells in blood. Thus, the staining pattern of B-B5 was quite reminiscent of a CD1c mAb rather than a CD1a mAb, and, in fact, we could show that our CD1c mAb AD5-8E7 inhibits binding of B-B5 to MOLT-4 cells (data not shown). Therefore, we conclude that B-B5 recognizes CD1c and that CD1c+ BDC do not express CD1a. Staining of CD1c+ BDC for CD1c, CD2, and CD14 revealed that a minor proportion of BDC expresses CD14 to a variable degree and that the level of CD1c as well as CD2 expression on these cells is inversely proportional to the level of CD14 expression (data not shown). This observation is in accordance with a linear differentiation model, in which CD1c+ CD2+ CD11cbright CD14− BDC are the progeny of CD14+ CD1c− CD2− monocytes rather than the progeny of a common precursor of both cell types. This concept finds further support in the observation of Crawford et al. (42) that a considerable proportion of CD14+ monocytes already expresses very low levels of CD2 and has the capacity to rapidly differentiate into mature DC with typical dendritic morphology and potent T cell stimulatory function when cultured with GM-CSF and IL-4. In summary, the results of this study identify three presumably novel markers of BDC in human blood: 1) BDCA-2, 2) BDCA-4 for CD11c− CD123bright plasmacytoid BDC, and 3) BDCA-3 for CD11c+ CD123− BDC. A third population of CD11cbright CD123dim BDC can be identified based on the expression of CD1c and the lack of B cell lineage Ags. It is noteworthy that the expression profile of BDCA-2, BDCA-3, and BDCA-4 is virtually indistinguishable on all three subsets after maturation in culture. The use of CD1c (BDCA-1), BDCA-2, BDCA-3, and BDCA-4 mAb provides a convenient and efficient way to rapidly detect, enumerate, and isolate BDC populations from PBMC, leukapheresis material, or whole blood without apparent functional perturbation. This will be a valuable aid for their further functional and molecular characterization and may prove useful in elucidating their interrelationships. Furthermore, the ability to easily isolate BDC populations to homogeneity will greatly facilitate their clinical use. We are grateful to W. Knapp, J. Moll, E. Butcher, J. P. Kinet, M. R. Parwaresch, and D. N. Hart for generous gifts of mAb. We thank S. Lange for expert technical assistance, and M. Assenmacher, I. Johnston, E. Müller, Y. Yamaguchi, and W. Godfrey for helpful discussions and comments on the manuscript. ↵2 Abbreviations used in this paper: BDC, blood dendritic cell; DC, dendritic cell; lin, lineage; MACS, magnetic cell sorting; Mo-DC, monocyte-derived DC; CD34-derived DC, CD34+ hemopoietic progenitor cell-derived DC; LY, Lucifer Yellow. Miltenyi, S., J. Schmitz. 1999. High gradient magnetic cell sorting. A. Radbruch, Jr, ed. Flow Cytometry and Cell Sorting 218 Springer-Verlag, Berlin.